Dog handlers holding sack for catching dogs at Jeevashram near Rajokri, New Delhi. Around the world, nations, cities, and villages are struggling with large roaming dog populations attacking children and adults, infecting people with rabies, especially in Asia and Africa, and the dogs are suffering as well. To address these serious and significant problems, Animal Birth Control (ABC) programs, also called CNVR (Capture, Neuter, Vaccinate, and Release) programs are dedicated to manage dog populations in a humane way and reduce human rabies spread by dogs. These organizations throughout the worldwide are often in remote settings and struggling to gather humane capture equipment and need as many humane tools as possible for catching dogs. Nets are fast and reliable and an important tool, but they can be expensive and difficult to get for some programs. The Sack Method is an alternative to netting-and even preferable-in some locals. It is easy to make, is inexpensive, and can be used to catch dogs in locations like narrow alleys where nets are not effective. 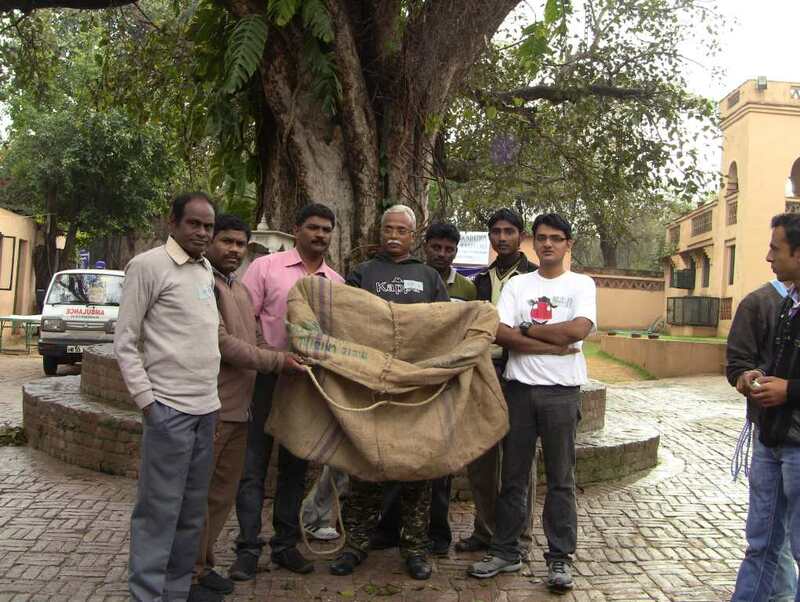 The Sack Method was invented in India and is described in the ABC Operations Manual for Help in Suffering (HIS), Jaipur India. According to the HIS manual, “It is the professional opinion of all the veterinary surgeons that have been involved with the ABC programme at H.I.S. that the sack catching method is by far the most humane method of catching dogs which can not safely be caught by hand. No injuries to dogs have been recorded following capture in a sack throughout the time this method has been used. Equally very few injuries to staff have resulted from the use of this method. 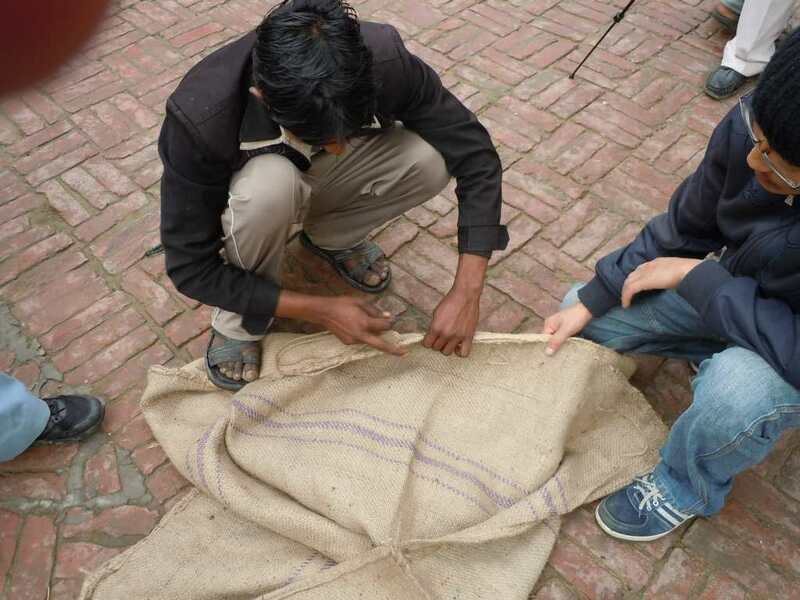 Furthermore the catching sack method is hard to abuse in the hands of inexperienced staff whose main consideration may not be animal welfare.” Many different names have been used for this tool and it would be good if all ABC programs in India agreed upon a single name. People have called it the “Sack and Loop” method, but this is confusing because people confuse this tool with the “Loop and Pole Method”. I suggest calling it the Sack Method since is it made from two burlap sacks. Sewing two burlap sacks into one larger sack. The Sack method uses two burlap sacks sewn together to make a larger sack. There are 8 metal rings sewn along the top edge. A rope is threaded through the rings and tied to the last ring. A loop is tied on the other end of the rope and placed around the handler’s wrist. The dog handler can secretly carry the net folded under his arm. The sack is thrown over the dog and the rope is pulled closing the sack. The sack can be twisted to reduce the dog’s struggling. 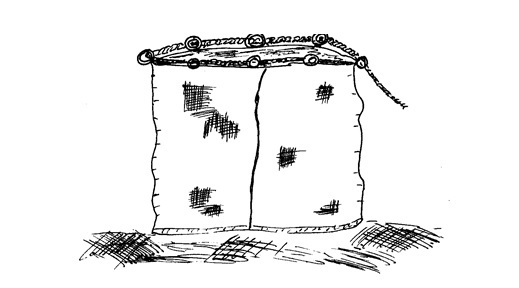 The sack is later lifted into the truck and the rope is loosened which releases the dog. Sacks will be soiled and need to be periodically washed. 4) Sixteen feet (5.5meters) of sissel or hemp rope. First open one side seam on each sack and sew them into one large sack. Then sew eight metal rings evenly spaced along the top edge. A 16 foot long rope is threaded through rings then tied to the last ring which works like a draw string. The free end of the rope has a loop to place around your wrist. Here is a great catch by Shyam Lal from Help in Suffering. Of course we are not successful with every throw. Here is a great attempt. In many places such as the narrow streets, the nets are too big and they are hard to hide. With the Sack you can easily tuck it under your arm and approach a dog without it knowing you are trying to catch him. Remember HOW you do it is as important as WHAT you do. We must be casual and calm when we approach the dogs, just as when we are working with the nets. Don’t focus on catching the dog when you approach them. If you do, your body language will be tense, and you will look like a predator. Be relaxed and hide your intentions. Let’s see an example of this. The Sack Method is one more effective and humane tools for catching dogs. It is important for CNVR programs to have as many different tools as possible. Try not to limit your program to just one tool. Dog handlers need many different options. Best wishes your successful spay/neuter and vaccination programs. There are several posts on this blog describing how to capture dogs with box traps. There are so many ways they can be used. You can set up a box trap and leave it to catch a specific dog, you can set up a trap line of boxtraps, check the trap line and gather dogs. You can also drive the streets, find dogs who will accept hand outs, and when you find one, set up a trap nearby, bait it, and entice them into the trap with food. To learn all of these ways for box trapping dogs get our new training DVD, “Humanely Box Trapping of Dogs” for sale on our GWR Products page. GWR has just posted our first You Tube video on humane and compassionate dog handling. It is titled: How to Humanely Handle a Street Dog. This video was filmed while I was teaching dog handlers from across India during Project Vet Train in Faridabad, India. Project Vet Train was a pilot program conducted by Vets Beyond Borders and the India Board of Animal Welfare. People can get very upset when they hear the word “dominance” used. I will NEVER promote punitive or demeaning actions towards a dog or wolf. Call it leadership with confidence. In this video I call it “compassionate dominance”. Whatever we wish to call it, here is a video demonstrating the use of the Y pole which is much more humane and safe for the wolf than catching them with nets. For an awesome article on the Y Pole and how to make them – visit our Free Training Library. I would love your comments!